"The new Palm smartphone. The word is, it's great for email, mobile internet, instant messaging, text and - with a full keyboard - saying what you really mean... Sign up now and you'll be the first to know all about the latest cool phone from Palm on 12th September 2007." It's likely that this mystery phone could be the new Centro, or a variant thereof. Numerous pictures of a couple of new Palm smartphones have been leaked over the summer. There's no hint of which network it will be appearing on, but if you were to guess Vodafone you probably wouldn't be far off the mark: not only did they partner with Palm on the Treo 750v, but they also just happen to have coverage in all four of the aforementioned nations. Secondly, I am eagerly waiting for the new Treo series. 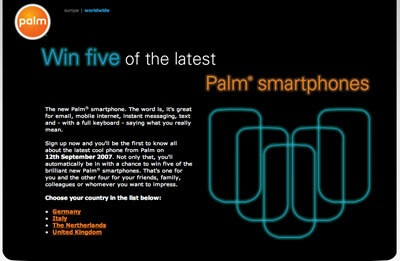 If it comes in 5 flavors (as the teaser's picture suggests) I would choose the one which combines PalmOS+WiFi. really hate to burst that bubble... the five phones most likely not five different phones, but probably just one phone... the "centro" or whatever they're going to call it, in five different colors. If it's the "centro" then having wifi is impossible... the aged Palm garnet OS cannot support both a cellular radio and a wifi radio in one device... ever wonder why Palm never release a treo driver for they sd wifi card? Are they really convinced that limiting the competition to just 4 European countries is going to increase their popularity in the remaining countries? Since Palm doesn't seem to be interested in selling whatever new product they have to me and millions of others living in France, Spain, the Nordic countries,... I think it is best that we look elsewhere. RE: What is Palm thinking? If it is an unlocked GSM, it will work almost anywhere. I know Palm tends to hire a lot of youngsters - but c'mon kids... at least run a spell checker if you haven't had a chance to get out of the U.S.A. yet. RE: huh? Wha' happened to Spain? == #bull;#nbsp; #a href="/uk/thenewsmartphone/index.html">United Kingdom#/a>#br />..."
Whatever the reason - it's not like Palm is releasing so many new devices nowadays (ever), especially in Europe, to let this stuff slide for days.. Allowing such a huge blunder to just sit there is an admission that either (1) nobody at Palm even pays any attention to their "big" announcements and/or (2) Someone without even the wisdom to spell check such an announcement is allowed to edit it. Probably from the same crew that's been beta testing the Treos for years. Perhaps I'm a mild "grammer nazi" and/or just too old to not pay attention when a multi-million dollar company puts up garbage like this ignoring the impression it gives of their quality control. When I was in the advertising business we threw out and reprinted thousands of dollars worth of printing for errors much less critical than misspelling the name of one of our four market countries on the front page of a brochure. Does the fact it's printed on the web instead of paper mean their audience is that less valuable? Sorry, but whether it's "true" or not - to me making major flubs like this is indicative of a company culture that isn't paying attention. Whether it's not putting enough RAM in devices to handle a reasonable install of software and databases, leaving out reset holes, shrinking battery life, changing to obscure flash card formats, etc - Palm isn't paying attention to what they are doing and it shows. I certainly can't disagree with you - it's pretty shocking, especially shocking that it remains there at the time of this post. It's not clear what sort of failure this is pointing out but it is indeed pointing out a failure. Perhaps I'm a mild "grammer nazi"
That's cool. I'm a spelling Nazi. I am really looking forward to what ever will come from Palm, but when I remember correct, I never got an email with further infos from any palm device ever released :D f*** those SignIns! From the "proxy filing" having to do with the purchase of about a quarter of PALM by a private group. Sept 12 phone, Sept X Foleo? So what's the consensus date for Foleo launch, eh? RE: Sept 12 phone, Sept X Foleo? OK, then I'll go: I say it'll happen on 9/19. A Wednesday. Do you think that Sept 12 will also bring the release of the new palm Desktop. I am hoping to get a few colours and additional features. Aarrrgh! Gee, maybe Palm is accepting preorders? HAAA!! This time from french site pdafrance.com . It's a white Palmos version, something we haven't seen before. In one picture it is shown side by side with a blackberry pearl (looks like it's bigger than the bb). They don't say. I wouldn't think so, though. The images show the word "Orange". Before they completely slip out of people's consciousness. That's a REVIEW. What are the SALES numbers? It doesn't matter what sales are(longer term). All that matters is the Me-Too Media is NOT talking about PALM.